During his five-day visit, Türk was accompanied by the Agency’s Director of the Bureau for Asia and the Pacific, Indrika Ratwatte, and the Director of External Relations, Dominique Hyde. Türk also met the key government officials, who have led the Rohingya response in Cox’s Bazar district, to review the challenges they are facing and the opportunities they see as the response evolves. UNHCR assistant high commissioner said he was encouraged by and deeply appreciative of the government’s unrelenting commitment to finding solutions and improving the situation for the Rohingya. 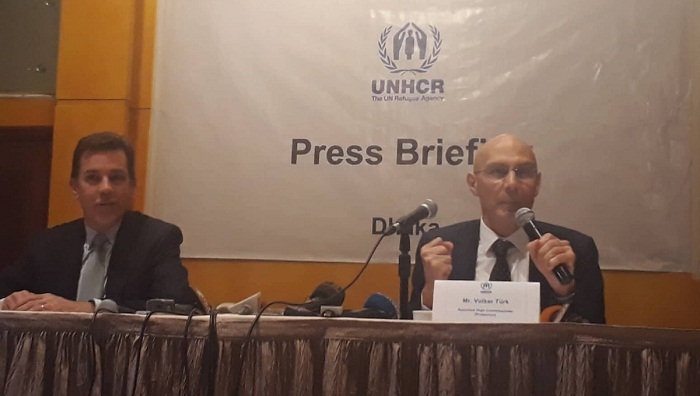 "UNHCR and the government have agreed to focus and strengthen collective efforts that can lead to tangible improvements in their lives, in particular women and girls at risk,” he added. UNHCR’s discussions with the government also focused on the importance of supporting Bangladeshi host communities. Türk said the people of Bangladesh and, especially those living in Ukhiya and Teknaf in Cox’s Bazar district were the first responders in 2017, and they have continued to show a tremendous humanitarian spirit and generosity. "The impacts of the Rohingya refugee presence on their lives must be recognised and addressed,” he said. While in Cox’s Bazar, Türk visited one of five centers in the Kutupalong settlements where a joint government-UNHCR registration exercise is being scaled up to provide biometric ID cards for all Rohingyas. “The Rohingya are a stateless people as well as refugees,” said Türk. “These cards are important means to protect their identity and their right to return to Myanmar. The Rohingya represent the largest group of stateless refugees in the world. Many have never had proper identity documents. This is a big milestone in protecting their identity,” he added. “I’m very impressed by how much we have all managed to achieve together, but also the way the refugee themselves are leading change within their community,” said Türk. “If you look around, it is very clear that the response is much more robust than what I saw a year and a half ago. The refugees tell me that they feel more secure, which is extremely important,” he said. He last visited Myanmar and Bangladesh in October and November of 2017.